Ever since Jennifer Beals wore a cutoff grey sweatshirt in the 1983 film Flashdance, the grey sweatshirt has been a mainstay on the fashion map. Season after season, designers make them, fashion editors wear them and bloggers covet them. Ahhhh the basic grey sweatshirt is a sartorial staple for good reason; it adapts to one's style and affords the lucky wearer that "downtown cool" so many of us seek. But that's only if you wear it right. You CANNOT wear the grey sweatshirt with messy hair, a face devoid of makeup, dirty running sneakers and sweatpants. That, my dear, is the easiest way to look like a frumpalicious soccer mom. Done right, the grey sweatshirt is uber chic (and comfy), and its color is universally flattering. 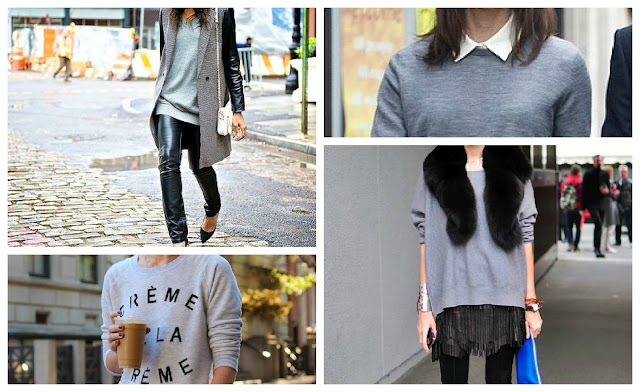 Even better yet, grey sweatshirts are a trend accessible at any price point. Gals on a budget should hit the boys or men's department (for a shrunken fit go with the boys) at big-box stores like Target, K-Mart and Walmart. Grey sweatshirts from brands like Fruit of the Loom and Hanes should cost little more than $5-$10. 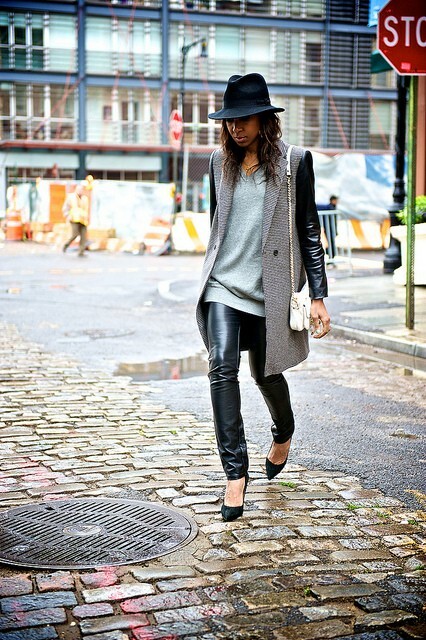 Karen of wheredidugetthat pairs her grey sweatshirt with pumps, a tailored tweed blazer and leather pants. She looks like a polished rockstar. The lesson from Karen: juxtapose textures... add leather, fur, lace, sequins or denim... and heels, of course! Blair Eadie, the blogger behind Atlantic-Pacific gives her grey sweatshirt an andogynous nod by leaving out her usual girly accessories and pairing it with boyfriend jeans. She then injects a dose of femininity with fuschia lipstick and a ballerina-esque topknot hairstyle. The lesson from Blair: a bold lip and a great hairstyle are enough. Do you own a grey sweatshirt? If so, what is your favorite thing to wear it with? What are your other wardrobe staples? I just posted some sweatshirt refashion ideas last night! I love the way they've been styled in this post. Great post Helene and I love the examples and the advice to avoid the frumpalicious soccer mom look. LOL! I guess I need a grey sweater now. Great eye and great advice!!! I've secretly looked at these sweaters imagining how I could pull it off. Thanks for the tips! This is a great post!! PS I hope you own a grey sweatshirt and you're working it well! cool... I will check it out! I love me a good grey, ivory or black sweatshirt. For this winter those are my staple pieces. I wear them inside out, outside in. I love them. Congrats on making it to Links A La Mode this week! I like the various ideas - each has it's own different tone, and suits a different occasion. Very nice post! My favourite grey sweater cost me all of $15 at Joe Fresh - it was a super find. Now I need to find find that fur stole Taylor's wearing...so many styling options! J, check h&m I got a faux fur stole there a couple of years ago... I love Joe Fresh too, a couple of my favorite sweaters are from there- they always have amazing sales! This sweatshirt makes every morning warm and comfortable. The awesome black and gray color combination. the shirt sleeves are actually long enough I am very tall so this is nice. And It shipped quickly.